Located adjacent to Cedar Point, Soak City is an 18-acre waterpark featuring more than a dozen thrilling water and inner tube slides, a gigantic 500,000-gallon wave pool, two relaxing inner tube river rides, two kids areas and much more. Soak City also offers guests a wide variety of sunny and shaded lounge areas for those who want to work on their suntan or ﬁnd a quiet spot to read a book or catch a nap. 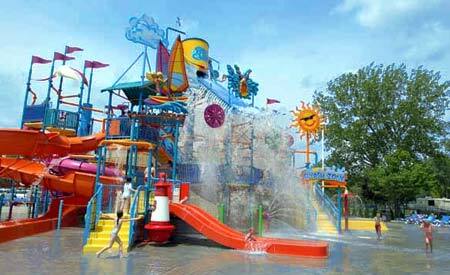 For convenience, Soak City also features a food court, lockers, showers, rest rooms and changing facilities and a merchandise shop with everything from swimsuits to suntan lotion. So if you're looking for the best way to cool off after a long day of riding the biggest collection of rides and roller coasters in the universe, Soak City has something for you! Not only fun, but safe as well -- Cedar Point hires and trains more than 100 lifeguards each year for Soak City, the Cedar Point Beach and the hotel and marina pools. The lifeguard training staff is certiﬁed by Ellis and Associates, Inc., based in Kingwood, Texas. The lifeguard staff at Cedar Point has earned numerous aquatic safety awards from Ellis and Associates. These designations are awarded to lifeguard crews that consistently exceed the requirements for certiﬁcation and provide the highest degree of swimmer protection in the industry.